Urine Off Odour and Stain Remover is a highly effective cleansing solution bio-enzymatic action. It washes off urine markings and urine stains caused by kittens and cats. The cleanser removes odour and stains on a permanent basis to keep the place fresh. It is effective on virtually any surface, be it the floor or carpet. 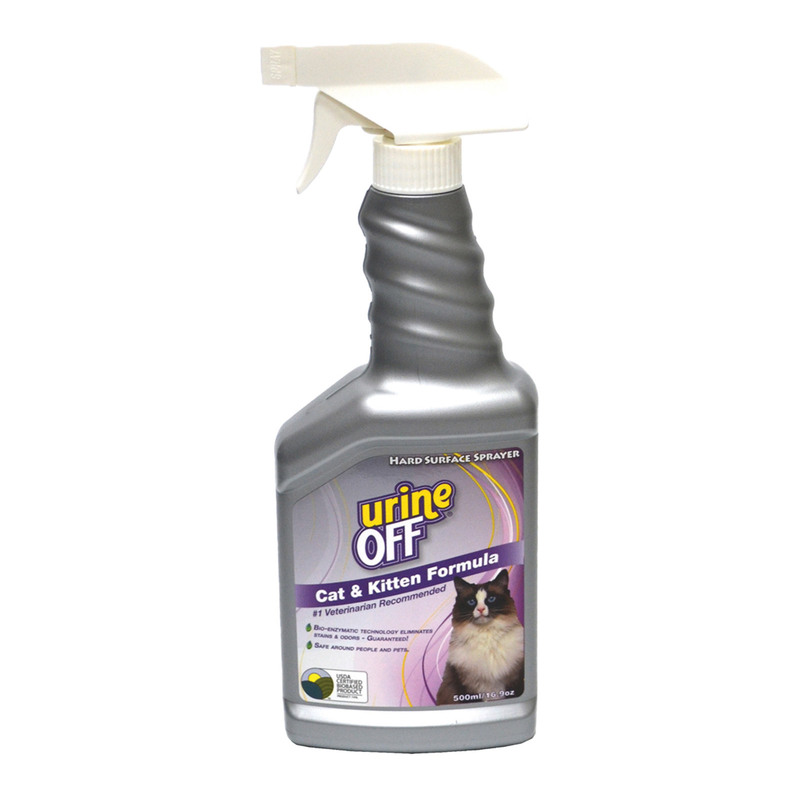 Urine Off Odour and Stain Remover breaks down uric acid crystal found in the feline’s urine to eliminate primary marking. It wipes out all three major components found in the urine of cats and kittens. This way, it washes off urine stains, markings and prevents odour. Shake the bottle before use. Wipe off excess wet urine with paper towel. To locate urine-soiled areas, use Urine Off Urine Finder Black Light. Set the spray bottle on ‘STREAM’ setting and spray on the urinated space. Make sure the entire area is covered and edges are overlapped with the liquid. Wash off the residue with meagre amount of water and blot with paper towel. Check for colourfastness before using it directly on the carpet. Let the liquid stay on the carpet. For best results – keep it for few minutes if the stain is fresh; for old stains, cover the treated old stain with plastic and keep it overnight. Remove plastic and let it dry naturally. Old stains may require multiple treatments of Urine Off. So, re-apply until the stain is completely removed. Note that you should not scrub the carpet or fabric. It's my go to product. I rely on it completely as I have two pups back at home. Does the work perfectly! The best product ever to treat Cat Urine !!! Very impressed with the effectiveness!!! My feline continually pees on the same spot. But after applying this product the horrible pee smell has gone. I never thought that this product would work, but it did. Highly recommended!!! This product is amazing. It gets rid of stains and odours from my kitty within seconds of application. Highly recommended!! !